A few weeks ago, the Full of Sith podcast featured a panel with Matt Martin of the Lucasfilm Story Group. An audience member made a statement that Rogue One, unlike the saga films, did not revolve around the Force. In his answer, Matt noted that the Force wasn’t the focal point of the movie. I was already thinking of this article when I heard this discussion and my immediate reaction was that they were wrong; the Force flows strongly throughout Rogue One. And just as the Force is often seen an analogue for religion, there are religious themes throughout as well. As I started researching this article, I re-watched the movie. One hour in and I had two pages of notes on the how the integral the Force and religion are to this Star Wars story. The movie’s prologue sets the tone. After the Ersos spot Orson Krennic’s shuttle and prepare their escape, Lyra pauses to put her kyber necklace on Jyn as she says, “Trust in the Force.” Lyra, from the start, makes a connection between the Force and trust. Years later, trust comes into play as Jyn and Cassian are leaving on their mission to Jeddah. Jyn appeals to trust when Cassian tries to relieve her of a pilfered blaster. Despite his misgivings, which are expressed by K-2SO, he allows Jyn to keep the blaster. Though not exactly in what we would consider a religious connection – appealing to trust as a religious concept in order to carry a weapon – there is an implication based on Lyra’s dialogue that the trust just starting to develop between our heroes has a basis in the Force. Later in the story, Jyn’s trust in the Force is more perceptible. As the strike team is infiltrating the Scariff shield gate, Jyn pulls out her kyber necklace and begins to hold it. In this more explicit display of trust Jyn is, perhaps subconsciously, appealing to the Force to help them accomplish their mission. It recalled the familiar scene of a soldier kissing a cross necklace before facing battle with the belief that God will protect them. Jyn is not the only character to put her trust in the Force. 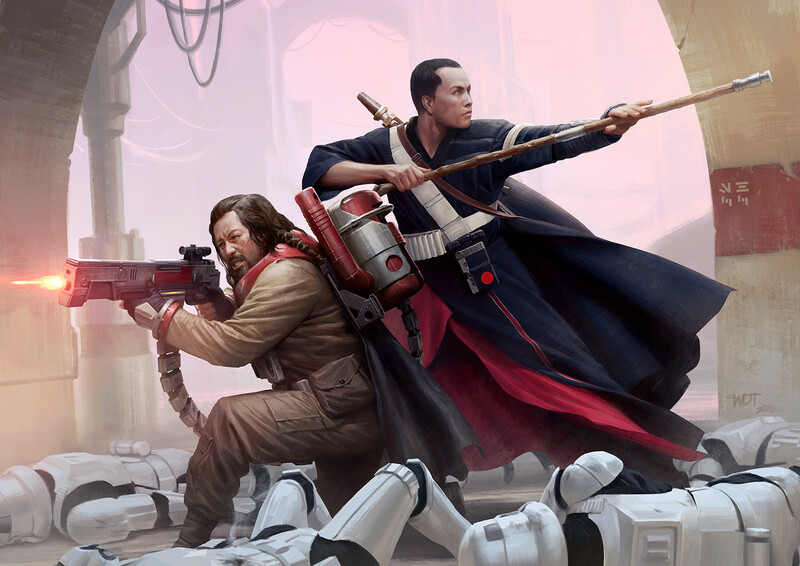 Chirrut Imwe, as a Guardian of the Whills, has his trust in the Force validated throughout the movie. Shortly after he displays his devastating martial skills against a squad of stormtroopers – itself a callback to the warrior-monks of Chinese and Japanese Buddhist tradition and the Christian knights of the Middle Ages (and no doubt the Jedi Arts of the saga itself) – Chirrut exclaims to his friend Baze, “The Force did protect me.” Incredulous, Baze responds, “I protected you.” On a superficial level, it seems that the message is that the Force was not responsible for Chirrut’s safety. But in the Christian tradition, people as the instruments of God’s will is a well-known concept. So from this point-of-view, the Force did protect Chirrut through the actions of his companion Baze. Chirrut’s trust in the Force was vindicated. It was vindicated again at the movie’s climax. Chirrut chants his prayer on his perilous walk to the master switch panel, “I’m one with the Force. The Force is with me.” The implication is again clear, Chirrut’s trust in the Force again protects him in this most critical moment. After a thousand generations of Jedi and other denominations of Force devotees, two decades of Imperial rule is not enough to remove the influence of the Force from the galaxy. Similar to the influence of Christianity in our own increasingly secularized society, there are traces of that ancient religion in the culture of Rogue One. Superficially, the temple in Jeddah City and the statutes in the wastelands outside the city are stark reminders of the Force. Like the Jewish Temple of Solomon in Jerusalem or the Kaaba in Mecca, it is a destination for pilgrims. And like many churches in Europe and other parts of the globe, it housed the holy relics of kyber crystals before it was desecrated, as churches often are in conquered lands, by the Empire. But the Force and its religious influences are even more apparent in the dialog used in the film. Once again from the prologue, we start with a subtle religious statement by the film’s antagonist. Galen, while buying time for his family to hide, claims that his wife Lyra has died. When she appears, it is Krennic who exclaims with mock astonishment, “Here’s Lyra back from the dead. It’s a miracle!” Resurrection and miracles are aspects many of us associate with religion, especially in the Christian tradition. Also recall Palpatine’s seduction of Anakin with his talk of the Dark Side’s “unnatural” ability to keep people from dying. Krennic and Tarkin refer to Jeddah City as the “holy” city. The irony is rather substantial as Tarkin calls it the holy city as he orders its destruction and Krennic uses the term when later describing that destruction to Galen Erso. There is a lot of meaning in such a short statement. Not only does he clearly put his trust in the Force but he recalls another religious concept: peace, which is important to all of the Abrahamic traditions. For the first time in a Star Wars movie, we hear a direct correlation between the famous, “May the Force be with you,” and it’s most apparent inspiration, the phrase “Peace be with you,” a common refrain in Christian liturgy. Further, he echoes the Jedi traditions of rejecting fear as a path to the dark side and the will of the Force. Moreover, on Eadu, when Chirrut sets out to follow Jyn, whose “path is clear,” Baze wishes him, “Good luck!” Older Star Wars fans will immediately think of Obi-Wan’s scolding of Han Solo aboard the Millennium Falcon, “In my experience, there’s no such thing as luck.” Younger fans might recall Jedi Master Ki-Adi Mundi’s response to Admiral Yularen at the Second Battle of Geonosis as depicted in the Clone Wars Season 2 classic “Landing at Point Rain” wherein the Jedi Master states, “There is no such thing as luck.” For Star Wars fans, the implication is clear: the Jedi reject the notion of luck in favor of an expression of the will of the Force. Chirrut playfully chastises Baze, “I don’t need luck. I have you.” Initially, I was surprised at this response. I expected Chirrut to say, “I don’t need luck. I have the Force.” But Chirrut’s turn of phrase does not necessarily signal to a rejection of his or Baze’s faith. Recall that in the Christian tradition, people are instruments of God’s will. Chirrut’s response can be seen as an embodiment of that concept. Besides the echo to earlier Star Wars stories, Baze’s use of “Good luck” signals that he has fallen away from his religion. He follows a long tradition as the once-devout character that has lost everything including his faith. As Chirrut explains, Baze was once the most devoted of the Guardians. But just as the original trilogy can be seen as the story of Darth Vader’s redemption, Rogue One presents the Baze’s redemption. A fundamental notion in Christian theology, it is believed that human sin is redeemed by Jesus’ death and resurrection. Baze’s redemption is the most striking in the film. But it is not to atone for past misdeeds; it is simply a return to his faith. As discussed, he is the fallen cleric. After his brief journey with Bodhi, Cassian, Jyn, and of course watching his friend and partner sacrifice himself to carry out one small part of the mission to steal the Death Star plans, Baze’s faith returns and his redemption is complete. As he faces deathtroopers and follows his fallen friend into the Force, he prays the old Force chant. The concept of redemption is introduced on Jedha. Still reeling from his encounter with Bor Gullet, Bodhi Rook confesses what motivated him to defect from the Empire he once served; he recounts to Cassian that Galen told him he could get “right by himself.” As a native of Jeddah, Bodhi had betrayed his home and became a collaborateur of the Imperial occupation. He must have felt extreme guilt for this betrayal. But Galen offered him a chance to fix his mistakes. As Bodhi explained, Galen told him to “listen to what was in my heart. Do something about it.” This would eventually allow him the peace he was seeking. It is apparent that Bodhi’s testimony made an impression on Cassian, taking the crack that was opened by Jyn’s trust and pushing him along the path of his own redemption. He later admits that he has done terrible things in the name of the Rebellion – we had already seen that firsthand when Cassian killed his informant Tivik in cold blood on the Ring of Kafrene to protect the intelligence that Tivik provided. Initially, Cassian is operating on the belief that the ends justify the means, a concept rejected by many religious traditions. Shortly after the conversation with Bodhi, Cassian has Galen in the crosshairs of his sniper rifle. As if his motivations were not clear enough, Chirrut says of Cassian that “the Force moves darkly near a creature that’s about to kill.” At first, Cassian literally rejects Bodhi’s offer of redemption by sending him away, ostensibly to steal a shuttle. But soon, Cassian doubts that he can justify assassination when other means – capturing Galen to either help in the Death Star’s destruction or to testify to the Senate – are more moral. Later in the film, Cassian’s efforts at redemption are more evolved as he offers to help Jyn infiltrate Scarif. Even K-2SO, the reprogrammed Imperial droid, has his own redemption. Originally made to serve the Evil Galactic Empire, he himself was rescued and reprogrammed by Cassian. Throughout the movie, K2’s motivation seems to be imposed by Cassian. But on Scarif, K2’s redemption is complete. First, he infiltrates the citadel, attacks several imperials, and finally shows his genuine affection for Jyn after she entrusts him with a blaster. Why is it that Baze dies immediately after Chirrut? For that matter, why is it that the other heroes die at the end of the movie as they do? For me, the religious connotation is a little more personal. While Rogue One does not have the spirituality or mysticism of The Empire Strikes Back or the Mortis arc of The Clone Wars, the Force and the religious influences of our culture are heavily woven into the story. Many of the characters grow in their trust of the will of the Force. Despite the Jedi purge, the Force continues to influence the culture of the galaxy and allows several of our heroes to redeem themselves. And finally, once they have fulfilled their purpose, that of playing their part in the Force’s design to end the evil of the Empire, our heroes stories end.